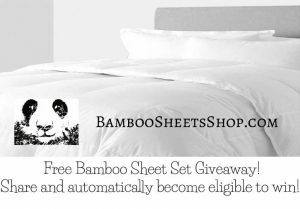 FREE Bamboo Sheet Set Giveaway! If a fan shares this image on Facebook or re-tweets it on Twitter, you will automatically be entered into the drawing for a FREE Bamboo Sheet Set!! Have you ever slept on Bamboo Sheets? How about under a Bamboo Duvet? Do you know what you’re missing? Disclaimer: Winner must like BambosSheetsShop Facebook page (https://www.facebook.com/BambooSheetsShop) or Follow us on Twitter (https://twitter.com/BambooSoft). Winner must send address and contact information within 48 hours of “Winner” announcement. Drawing will take place Monday December 30, 2013 (10am EST). There must be at least 50 shares in order for a winner to be selected.